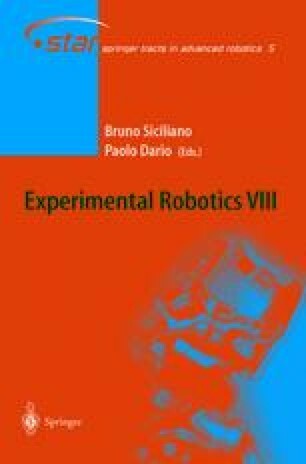 Visual control of robot motion may benefit from enhanced camera field of view. With traditional cameras the available fields of view are only enough to view a region around the observed object (for eye-in-hand systems) or around the end-effector (for independent-eye systems). Central catadioptric systems have larger fields of view thus allowing the entire robot AND the surrounding objects to be imaged with a unique camera. Therefore, the whole robot’s articulated mechanism can be observed and its joints can be tracked and controlled simultaneously. This results in a new visual robot control concept where tracking and control are embedded together. Key to the understanding of both servoing and tracking is the central catadioptric Jacobian matrix linking the robot’s joint velocities to image observations. In spite of a more complex projection matrix associated with catadioptric sensors, we study the catadioptric Jacobian matrix and we show that it does not introduce any additional singularity with respect to the traditional pinhole camera model. Experiments showing a rigid body being tracked with a catadioptric camera are described.